Ricochet and Adam Cole face off in a good main event on a show that also featured Dijakovic versus Shane Thorne, Taynara Conti versus Aliyah, and the Street Profits versus Carrillo and Stacey Ervin Jr.
Ricochet defends his North American title against an NXT almuni in an open challenge, EC3 goes after revenge on Bobby Fish, Mia Yim faces Reina Gonzalez to qualify for a number one contender’s match, and The Mighty suffer the wrath of Burch and Lorcan in a good episode of NXT. Keith Lee battles Lars Sullivan in a good fight between two big men in a show that also featured Lorcan and Burch versus The Mighty, Mia Yim versus Vanessa Borne, and EC3 versus Marcel Barthel. 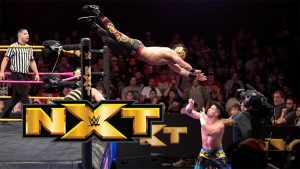 The Street Profits once again attempt to get revenge on The Mighty, Mercedes Martinez battles Nikki Cross, Burch and Lorcan have their hands full with Mendoza and Carillo, and Matt Riddle debuts against Menzies in a great episode of NXT. Otis Dozovic gets an opportunity to face the NXT Champ Tommaso Ciampa, the Street Profits look for a measure of revenge on The Mighty, Kairi Sane is confronted by Shanya Baszler, and more on a good episode of NXT. 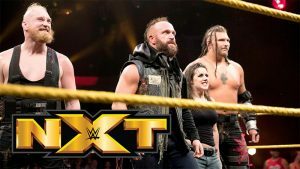 Kassius Ohno makes a statement, the Forgotten Sons make an impact, Shayna Baszler makes her intentions known, and Velveteen Dream makes Gargano question himself in a good episode of NXT. Strong faces Bate in the main event of a night that also gave Kairi Sane some momentum heading into her title match with Shayna Baszler. Kairi Sane and Lacey Evans battle to end their feud, Johnny Gargano busts open Tommaso Ciampa, Roderick Strong fights Danny Burch, and more on a good episode of NXT. Johnny Gargano returns to make an announcement about his future, Lars Sullivan takes on the team of Ricochet and Velveteen Dream, Kairi Sane looks for some revenge against Lacey Evans, and Heavy Machinery take on TM61 in a good episode of NXT. Candice LeRae confronts Tommaso Ciampa and The Undisputed Era faces Dunne, Lorcan, and Burch in a great main event on a pretty good episode of NXT. Pete Dunne tries to get revenge on Roderick Strong in a pretty good episode of NXT. Roderick Strong and Tyler Bate battle to determine a number one contender for the UK Title in a show that was otherwise a wrap-up or Takeover. 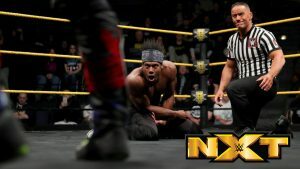 This fine episode of NXT had some fine matches including a number one contender’s match for the tag title between the Street Profits and the Authors of Pain. The entire second round of the Dusty Classic is decided in some good matches, though two of those matches are marred by injuries. This show had some surprises, and the main event tag match helped make this a show worth watching even though most of the actual wrestling isn’t anything special. With a handful of debuts, two more matches in the Dusty Classic, and a minor payoff to Samoa Joe’s attacks over the last few weeks, this was an entertaining episode of NXT. This was a good episode of NXT with two very nice matches and two that were basically exhibitions. This was essentially a recap of Takeover with a couple of filler matches. That’s not to say the matches weren’t good, they were fine, but they didn’t really mean much. Wrestlers calling fans "marks" is one of the dumbest and laziest ways to try to get people mad. Also, wrestlers putting down other wrestlers for being agile and athletic probably means you're a boring wrestler. Doing both at the same time means you're probably irrelevant.